Hind Feet volunteers during the health camp in Iganga yesterday. Photo by Joseph Lyagoba. IGANGA–Hind Feet project in partnership with other non-governmental organizations has organized a health camp at Bulowoza Primary School in Bulamagi sub-county Iganga district. The week-long health camp that started yesterday targets 3000 residents, according to Ms Charity Bukenya, the project social responsibility manager. The Hind’s Feet Project (HFP) is a non-profit organization in Uganda that focuses on making health information accessible to all regardless of background, education or literacy level. Yesterday’s event saw various medical services offered which included; Hepatitis B screening, Dental and eye checkups, general medicine, screening for HIV, diabetes, ulcers, blood pressure, syphilis and other sexually transmitted diseases, screening and tests for malaria and cervical cancer, safe male circumcision, Nutritional consultations, Consultations on disease prevention and management as well as onsite treatment for common illnesses. Hind Feet volunteers during a past health camp. Dr Victor Afayo, from Hind’s Feet, noted that extending health services to rural communities is important as access to healthcare remains a key issue. “The poverty in the area makes access to healthcare by many residents a problem. 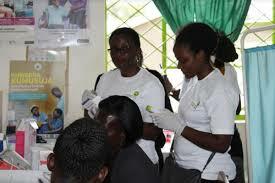 We, therefore, hope that through this initiative, the community will get the much needed services,” Dr Afayo explained.